Justice Department Issues Scathing Report On Baltimore Police Department : The Two-Way The report finds that Baltimore police disproportionately targeted African-Americans for stops and arrests, and police retaliated against citizens for exercising their right to free speech. 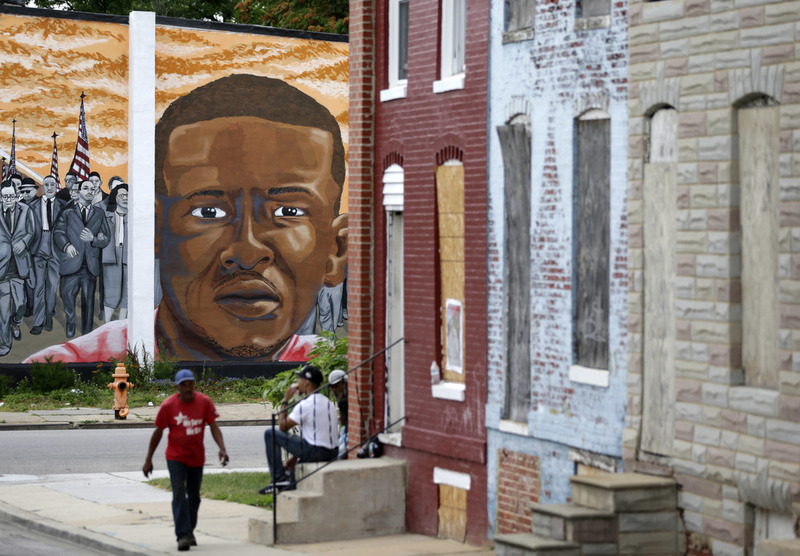 People walk by a mural depicting Freddie Gray in Baltimore on June 23, at the intersection where Gray was arrested in 2015. The Baltimore Police Department has disproportionately targeted African-Americans for stops and arrests, a Justice Department investigation has found. After the police department took a "zero tolerance" approach to policing in the early 2000s, the report finds, it began engaging in a pattern and practice of discriminatory policing. Statistics analyzed in the scathing 163-page report show that the magnitude of racial differences in stops, searches and arrests is so pronounced, it might point to "intentional discrimination." In one case, for example, an African-American man in his mid-50s was stopped 30 times in less than four years by police, yet none of the stops ever resulted in a citation or criminal charge. Investigators found instances in which leaders in the department ordered officers to directly target black residents. In one case, a commander allegedly told a lieutenant to order her officers to "lock up all the black hoodies." The statistics reveal that the Baltimore Police Department stopped and arrested more people in predominantly black areas of town. From January 2010-May 2014, police made some 300,000 stops — 44 percent of which were in two predominantly black areas that make up 12 percent of the city's population. Citywide, the report finds, the Baltimore Police Department "stopped African-American residents three times as often as white residents after controlling for the population of the area in which the stops occurred." The Justice Department launched a civil rights investigation in May 2015, after the city was beset by protests and riots over the death of Freddie Gray. The report finds that police made too many unjustified stops and used force unnecessarily. Other times, police officers reacted simply because a citizen was exercising their right to free speech. One officer, for example, listed an arrestee's "mouth" as his weapon. "BPD's legacy of zero tolerance enforcement continues to drive its policing in certain Baltimore neighborhoods and leads to unconstitutional stops, searches, and arrests. Many BPD supervisors instruct officers to make frequent stops and arrests—even for minor offenses and with minimal or no suspicion—without sufficient consideration of whether this enforcement strategy promotes public safety and community trust or conforms to constitutional standards. These instructions, coupled with minimal supervision and accountability for misconduct, lead to constitutional violations." "We encourage BPD to be proactive, to get to know Baltimore's communities more deeply, build trust, and reduce crime together with the communities it serves." Over the past few years, the Justice Department has conducted similar investigations in places like Newark, Ferguson, Mo., and Albuquerque. It has often come to similar conclusions: Police departments were violating the civil rights of citizens with racially biased police practices and excessive use of force. Many times, these investigations lead to negotiations and agreements between police departments and the Justice Department that are designed to curb some of the violations. Those agreements often involve more stringent record-keeping and the appointment of an independent monitor who makes sure changes that are agreed to actually happen. In Baltimore, it was outgoing Mayor Stephanie Rawlings-Blake who called for a federal probe after near-daily protests boiled over into a night of riots in the spring of 2015. The demonstrators demanded justice for Gray, who suffered a fatal spine injury in police custody. A total of six officers were charged in the death. Three were acquitted during bench trials, and prosecutors dropped charges for the remaining three officers last month.